MKs Ahmed Tibi and Ibrahim Sarsour condemn the police for raiding a noisy mosque in Jaffa, threaten consequences. Arab parties Raam and Taal on Thursday issued a statement condemning what they called “the barbaric behavior of the police and the Ministry of Environment” in confiscating the speakers of a noisy mosque in Yafo (Jaffa). The parties said police broke into the mosque on Tuesday and forcefully removed the speakers from the mosque, which is located in a complex belonging to the Abu Sayaf family. 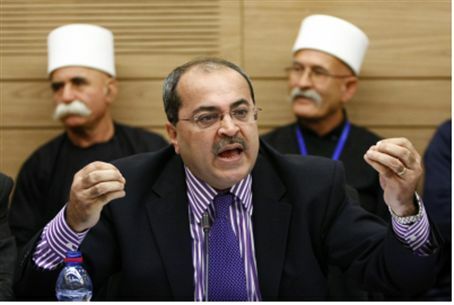 MK Ahmed Tibi (Taal) has submitted an urgent query to Public Security Minister Yitzhak Aharonovitch in which he condemned what he termed the “inhuman” measures taken against the mosque. Tibi also claimed the raid was carried out following complaints about the mosque by factors related to the Yisrael Beiteinu party. He said the complaints were inappropriate since they were filed soon after Yisrael Beiteinu’s MK Anastassia Michaeli submitted her bill that would require mosques to temper the sound of the muezzin. Sarsour added that the Arab masses reserve the right to respond to these attacks and said that the government alone will be responsible for the devastating consequences of its “brutal” policies. Tibi and Sarsour are both notorious for the anti-Israel statements they constantly make. Tibi recently launched a verbal assault on the head of the Manhigut Yehudit faction in the Likud, Moshe Feiglin. Tibi’s tirade came after Feiglin suggested that there is no evidence to suggest that the recent arsons in mosques were carried out by Jewish nationalists. Sarsour recently called to establish an Islamic Caliphate centered in Jerusalem and praised Hizbullah for defeating Israel. He has also urged Arab and Muslim leaders to wage war on Israel, citing Christian Zionists as one of the elements conspiring to ‘Judaize’ Jerusalem.